Vanish Seriath: Aw, what was it? Vanish Seriath: I was worried it was me, as it seemed to crash every time I just got in. Vanish Seriath: Well, it is a great build! Vanish Seriath: El said it was such a shame it was running so laggy there. Vanish Seriath: She thought it needed much more exposure. Pathfinder Lester: haha! i loved that pic. my pleasure! Nyx Ivory: it was spooky alone! Pathfinder Lester: I think that’s a very important part of our club here. giving people guides so they can explore on their own at their own time. SarVana Cherry: now that I got the right time, I am good… the EST notation was a big help. Vanish Seriath: I’m V of http://tgib.co.uk, hello everyone. Vanish Seriath: Does that mean I need to learn french? Pathfinder Lester: brush up on it! Vanish Seriath: Mmmh, I think I can do that. Pathfinder Lester: so once we find a date for that, i’ll send a tweet about it and send something to the HGAC google group with more info. Pathfinder Lester: that’s all I have for announcements. anyone else have anything to share? Vanish Seriath: Well, I just started. 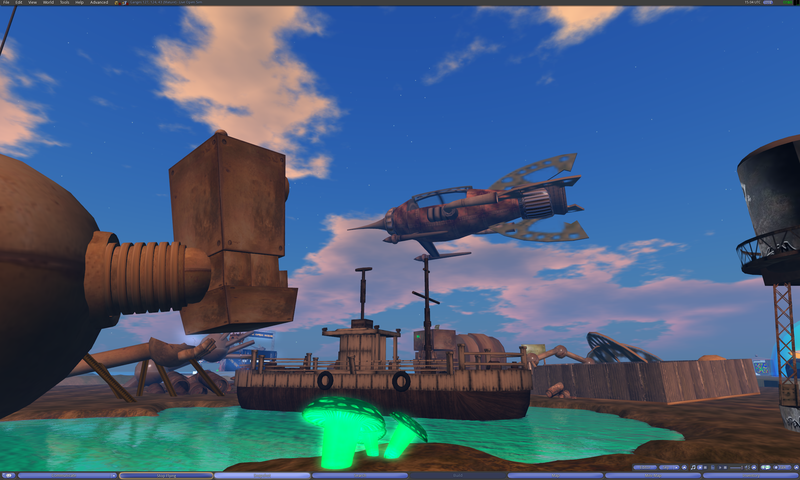 Pathfinder Lester: we can take a tour of your tutorial region when you’re ready, too! Pathfinder Lester: i haven’t commented about it on your blog yet, but i will soon. Once we arrive, we’ll make a local teleport to the region “Ganges.” Just open your world map and search for it. 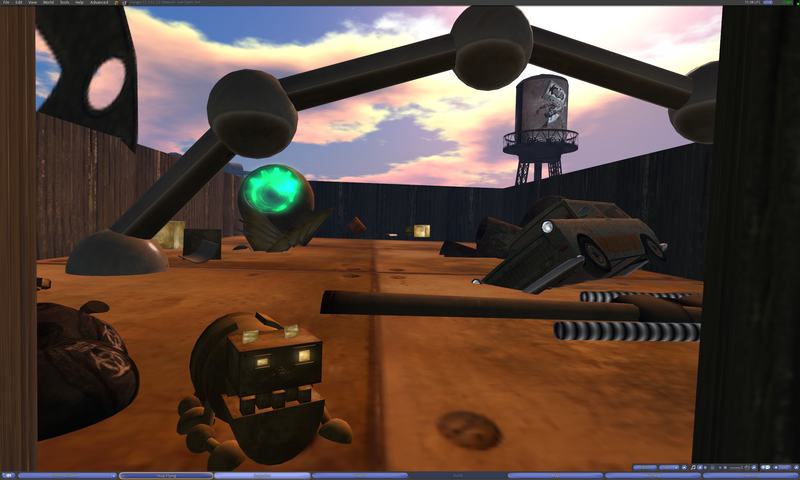 On Ganges we’ll find a deserted junkyard with a giant robot. Just beware of the toxic waste. Vanish Seriath: I never heard of it. Pete McConachie: Where is Johnny Sokko now? Pathfinder Lester: i hope not! 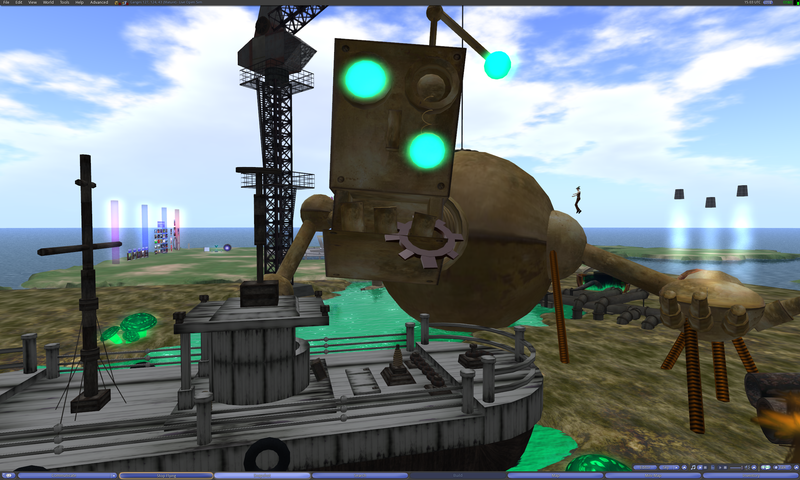 Pathfinder Lester: speaking of giant robots….i’ve never seen anyone with a giant avatar in opensim. have any of you? Vanish Seriath: Neb has some alien avi, but it’s not too big. 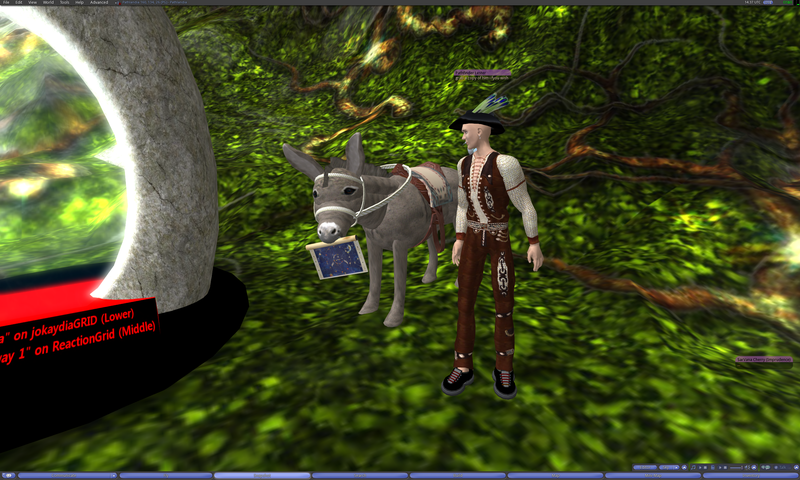 Vanish Seriath: There aren’t many non-human avatars in OpenSim at all. Vanish Seriath: Well, you would need to make the animations along with it, just like with tinies. Vanish Seriath: So it requires some skill. Vanish Seriath: Need to work on that. 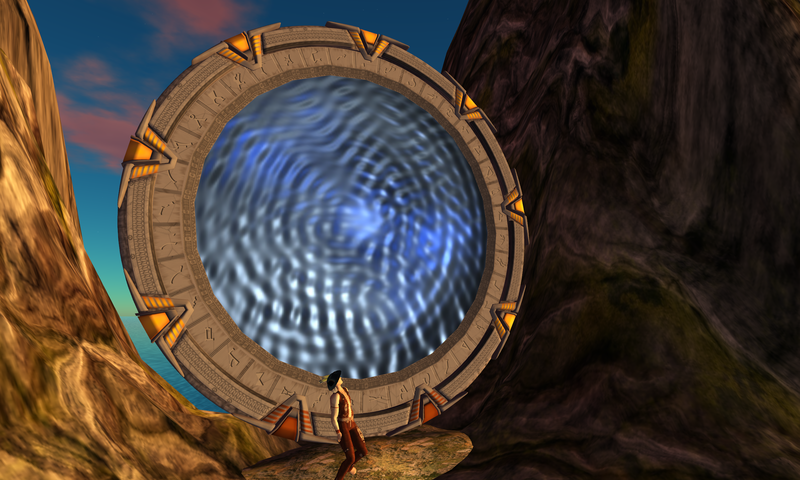 Jeff Kelley: I have a question about the “Experimental Stargate”. What is its license, may we re-distribute it? 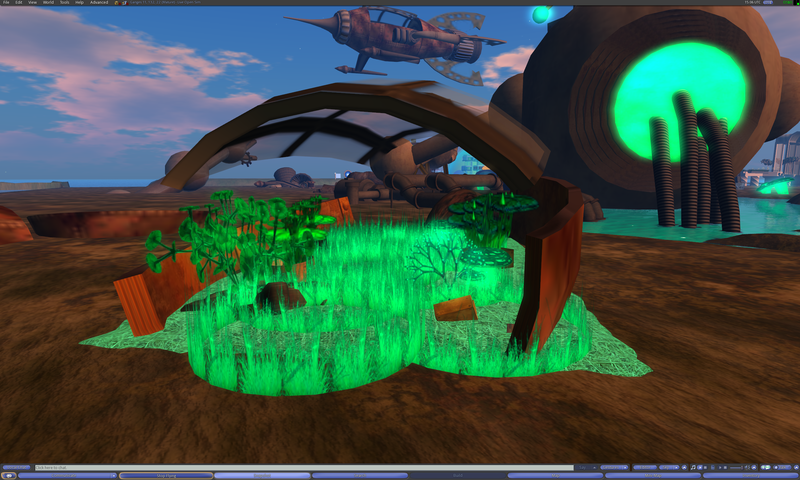 Pathfinder Lester: Jeff, well, I found that stargate on FrancoGrid, and it was full-perm. so I’m assuming that would be fine. SarVana Cherry: Pathfinder, is it ok to take a copy of your stone gate for my quick shopping trips from my own place? Vanish Seriath: I tried the blamgate scripts yesterday, but couldn’t get it to work yet. Vanish Seriath: Somehow, I failed at enabling osfunctions. Vanish Seriath: I set threat level to high, but still I get an error that it’s medium. Vanish Seriath: Well, need to look into it again when I have more time. Vanish Seriath: No, I didn’t. Vanish Seriath: Somehow I didn’t see that. Vanish Seriath: Thanks a lot. Vanish Seriath: I’ll give it another try later. Pathfinder Lester: if anyone comes up with neat modifications to the blamgates, please let me know. 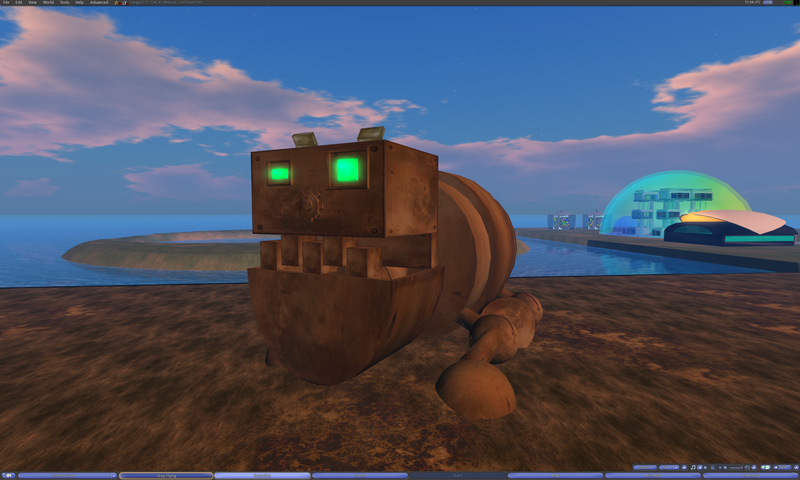 Pathfinder Lester: i’m not really a scripter, so I’ve just cobbled things together. I suspect real coders could much more elegantly extend on how they work. Pathfinder Lester: well, speaking of blamgates, looks like we should start our trip for today! Pathfinder Lester: i found him on Romenna, actually! We enter an instant hypergate (aka “Blamgate) on the region Pathlandia on jokaydiaGRID. 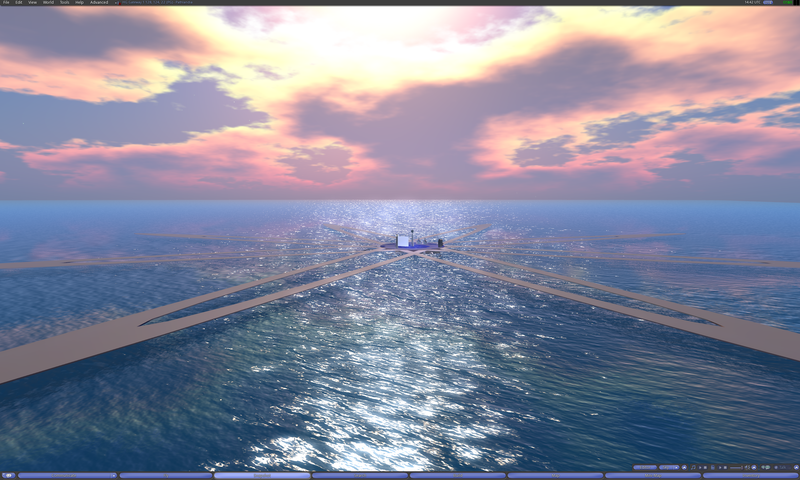 We all make a manual hypergrid jump and arrive on the region Eiffel on FrancoGrid. And from there, we make a local teleport to the region Ganges. Pathfinder Lester: what is your project? 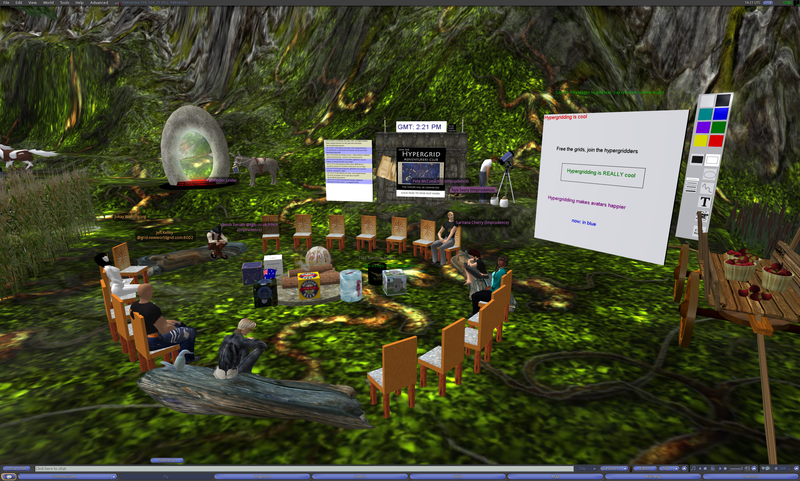 Pathfinder Lester: we could visit balzac on a future tour. ty for the invitation! 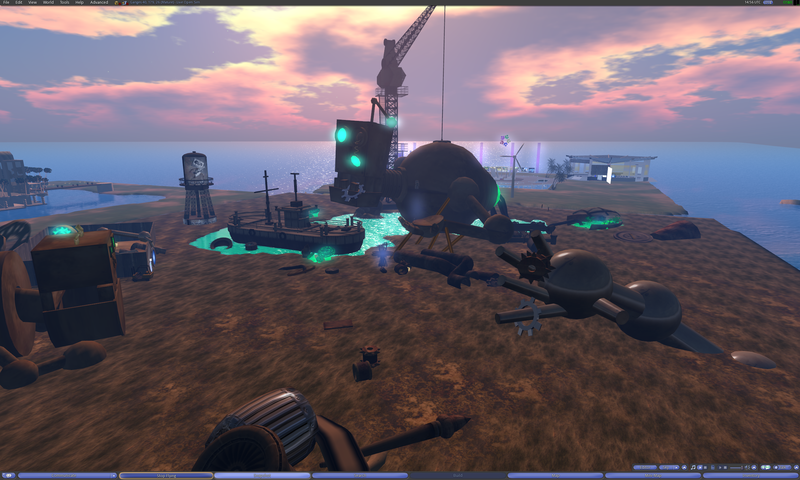 Pathfinder Lester: mathijs, is there a website with more info about your school’s project here on FrancoGrid? Pete McConachie: I’m going to have to go and play tennis in RL. See you all next week I hope. Thanks Path. 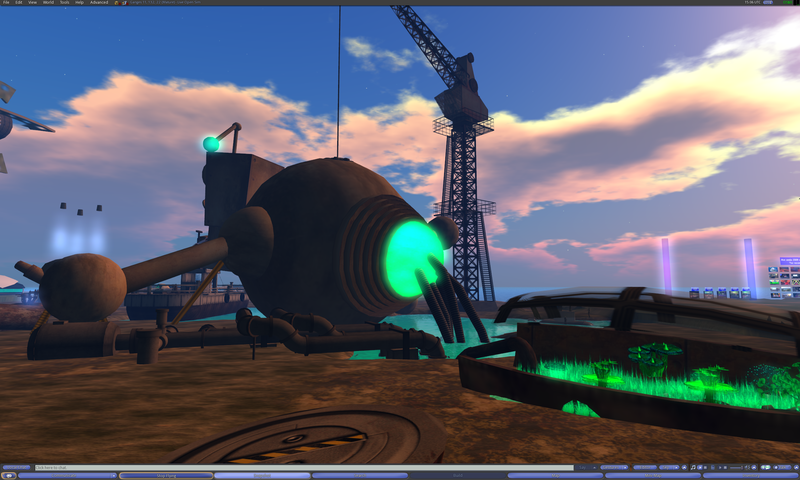 This entry was posted in Announcements, Avatars, Education, Hypergrid Adventurers Club, OpenSim, Virtual Worlds and tagged avatars, francogrid, HyperGate, HyperGrid, Hypergrid Adventurers Club, jokaydiagrid, metaverse, OpenSim, ReactionGrid, robots, virtual worlds by John "Pathfinder" Lester. Bookmark the permalink.